We recently had the opportunity to work on the world’s largest sport fishing boat, a 144’ Trinity. The yacht was recently sold and her new owner had her hauled at Lauderdale Marine Center for a complete refit including new engines (repower). The vessel originally had old Paxman engines that were removed by cutting a large hole in the side of the boat and replaced with new MTU engines. A job of this size requires precision coordination with other contractors at LMC who handle engine rigging and removal, welding, plumbing, painting and full MTU service commissioning. 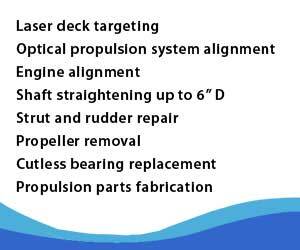 For our part, we first performed a laser deck targeting procedure to block the vessel properly for hull work and future alignments. We then removed the running gear from the boat so our machine shop could straighten the shafts, lap fit face couplers and propellers and ABS crack test the shafts. 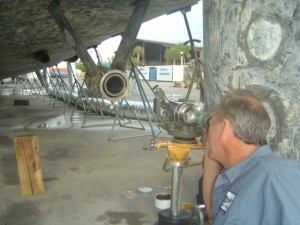 Next, we performed an optical scope alignment of the remote transmissions to the shaft line and used Chockfast® to hold the transmissions in place. Working closely with the aluminum fabricators and MTU engine plans, our team made sure that the new engine beds and stringers were in the right position and the right height for the new engines and engine mounts. The next step was to install the new engine mounts on the engines and rough align the engines with the transmissions using lasers for final engine room fabrication. Our machine shop, Straight Line Marine, then machined the new sole plates for the engine mounts. We also installed Gieslinger torsional couplings between the engines and transmissions and provided all new bearings and shaft seals. Once the vessel was launched, we did a final laser alignment of the engines to the transmissions and used Chockfast to place all engine mounts into position. The vessel is now ready to take her owners far and wide in search of big game fish.